Dan was on Good Morning America Tuesday, April 22nd to discuss the trial of Byron Smith, a 65 year old man from Minnesota, accused of murdering two teens who entered his home on Thanksgiving of 2012. Smith is charged with first-degree premeditated murder for shooting and kill 17 year old Nick Brady and his cousin 16 year old Haile Kifer. Smith is claiming self defense and that he had been on guard and worried after several break-ins and under Minnesota law a person may use deadly force to prevent a felony from taking place in one’s home. 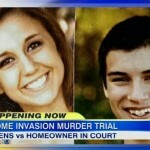 However, prosecutors are trying to prove that Smith planned the killings. Dan provided some insight into the case. Says Dan, “You do have more ability to use deadly force in your own home when you’re trying to prevent a felony or you’re trying to protect yourself but there are going to be two key words in the law: necessary and reasonable. Those are going to be the two questions that this jury is going to grapple with, was it necessary and was the force reasonable.” Watch the full clip here.